I’ve written before about how you can save money in Paris using UberPOOL. Now you can save money in New York with UberPOOL. 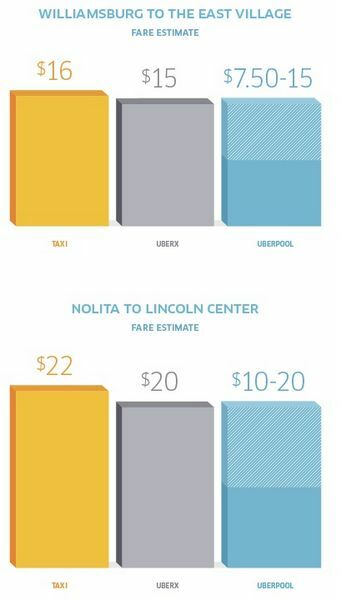 Folks visiting New York City can save money on cabs by choosing UberPOOL instead. Share an Uber ride with people headed in your direction to save up to 50%. UberPOOL lets you share a ride (and the cost) with other folks heading in the same direction. When you use UberPOOL in San Francisco, Paris, and now the 5 boroughs of New York City you’ll save up to 50% on your Uber ride. Folks who choose UberPOOL will be matched up with another requester. But each UberPOOL pickup can have a maximum of 2 riders. So if you’re traveling with several friends, you can NOT use UberPOOL. UberPOOL is a little different than the normal Uber service, so there’s a UberPOOL FAQ page if you have questions. For instance, with UberPOOL there’s a fee if you cancel more than 5 minutes after your request for a car. You can save $10 on your next Uber ride with AMEX Offers. And if you haven’t signed up for Uber, you can save an additional $20 when you use my link. Depending on the people in your car, UberPOOL might be a fun way to save money while getting around! You can earn 2X Chase Ultimate Rewards points paying for travel (including Uber) with your Chase Sapphire Preferred card. And 2.1% back when you use your Barclaycard Arrival Plus World Elite Mastercard. That’s because Uber is considered a travel expense. Additionally, you get 2X American Express Membership Rewards points when you use an American Express card with Uber. Plus, you can save money by using American Express Membership Rewards points to pay for your Uber ride. Although I’d rather use my AMEX points for more valuable airline and hotel transfers! You can save up to 50% when you use UberPOOL in San Francisco, Paris, and now New York. When you choose UberPOOL you’ll be matched up with someone heading in the same direction. But the ride won’t be crowded because there’s a maximum of 4 UberPOOL riders allowed. So if you’re traveling with a group, you can NOT use UberPOOL. If you’re new to Uber, you can save $20 on your 1st ride when you sign-up with my link. And you can get another $10 off an Uber ride with AMEX Offers. New York is 1 of the cities where Uber includes Spotify music service. So with UberPOOL, I wonder who gets to pick the playlist!